Verify that there is a full backup for the CardioLog database. Stop the CardioLog windows services (CardioLog Diagnostics Service, CardioLog Scheduling Service) on the CardioLog application server. Stop IIS on the CardioLog application server (in order to stop data collection and http requests to the CardioLog application during the move). Detach the CardioLog database from the origin server. Copy the database files (data + log) to the destination server. Attach the CardioLog database to the destination server. Start the CardioLog Windows services (CardioLog Diagnostics Service, CardioLog Scheduling Service) on the CardioLog application server. Start IIS on the CardioLog application server. If you have not upgraded your product to the latest release yet, it is highly recommended to do so prior to migrating the CardioLog application. Find out what's the latest version by viewing our KB. To find out what is current your product version, go to Administration > Product License. Import the CardioLog registry key to the new server (copy the *.reg file to the new server and double click on it to add it). 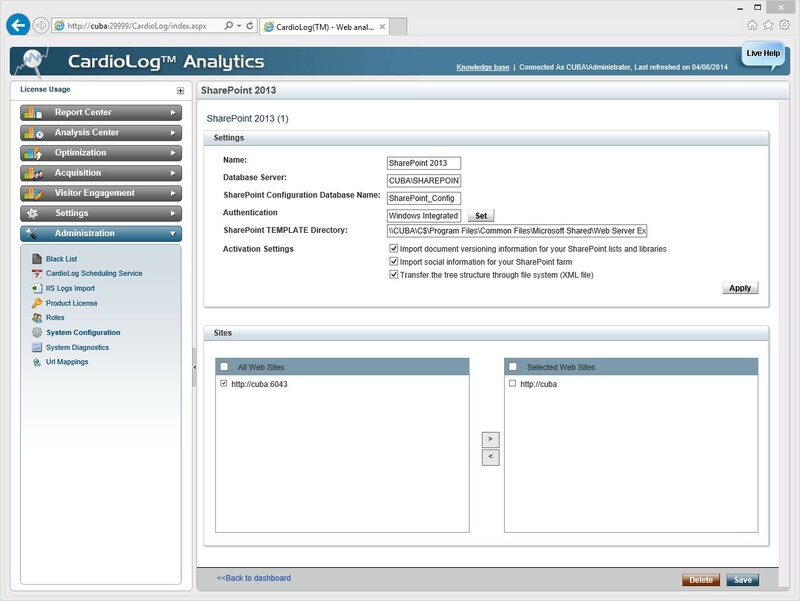 Disable the CardioLog windows services (CardioLog Diagnostics Service, CardioLog Scheduling Service) on the old CardioLog application server. Run the CardioLog installer on the new server (contact us to receive it). Follow the Installation Wizard steps. Create a backup of the [CardioLog Installation Folder]\CardioLogScheduleServices\Settings.config on the new server. Copy the [CardioLog Installation Folder]\CardioLogScheduleServices\Settings.config from the old server to the new server and edit all instances of the CardioLog server name (http://[CardioLog server name:port]/) and the CardioLog Installation Folder path. Otherwise, edit the CardioLog Java Script tracking code embedded within a common Java Script file, located on your SharePoint WFEs. The code is located at the end of the file, between these comments: "//Intlock tracking code start", "//Intlock tracking code end". Select the web application/s you want to monitor, then click Save. After the next run of Portal Tree Updates, the updated tree structure will be displayed in Analysis Center (Object Explorer). In the Administration pane, click System Configuration, select Usage Tracking Code and then select your SharePoint version.